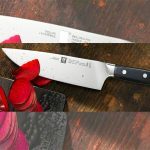 Home Brands What’s The Best Knife Set of 2019? Find it Here. What’s The Best Knife Set of 2019? Find it Here. What are the essential knives in a knife set? How can you tell a knife set has quality pieces? Do you need a warranty for a knife set? Why can’t I wash my knife set in a dishwasher? How Much Will You Pay for the Best Knife Set? The best knife set doesn't have to be flashy to grace your countertop, just practical and functional. There's nothing wrong with individual pieces, but a set gives you more options. But how do you know which set to buy? Watching cooking shows can be misleading because of product placement marketing. Instead, have a thorough evaluation of your regular kitchen prep work to figure out which knife set will work for you. There are several things to consider when purchasing a knife set. The most important of these is knowing the market and knowing your own needs. The best knife set can be a statement piece in a kitchen but it also has to fit the needs of the household. Our eight knife sets fall into both categories and score highly on the metrics we used for reviewing. The Premium Class Stainless Steel Kitchen 6 Knife Set has a solid build. The blades are 420-grade stainless steel that doesn't wear easily and they are steel from tip to handle. They are reportedly resilient and can keep their edge even after months of constant use. The set comes with a well-built acrylic stand for storage. The blades have a thickness of 2.5 mm with only the paring knife having a 2 mm width. This is a simple knife set with an affordable price tag. The manufacturers are careful to include a drying towel with the set to encourage users to dry the knives completely once they are washed. If left to air dry or washed in a dishwasher they will rust. Another disadvantage with the set is that the knives face downward in the stand instead of being angled for convenience when retrieving them. You will love not having to worry about a handle falling off because they are a solid piece from tip to handle. Also, the see-through stand allows you to see which knife you're picking. It has an average customer rating of 4.3 out of 5 stars on Amazon. You can also purchase it on eBay. Victorinox is a leading Swiss brand of knives that strives to make the best knife set with every set they create. While it's not as cheap as the Premium Class Stainless Steel set above it is a bargain considering the quality of knives. 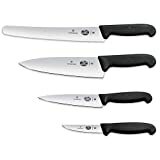 It has four knives in the set and is the ideal option for a beginner cook or the occasional cook. The blades are high carbon stainless steel which is hardy and holds the edge exceptionally when sharp. The blades are lightweight but have adequate balance from the tip to the handle although you have to get used to the lightness of the blade. The handles are made from fibrox and are textured to help them maintain excellent grip even when wet. This set has high-quality materials and construction that result in a durable and strong end product. The blades come sharp and ready to use holding the edge for a long time. Unfortunately, the set doesn’t come with a stand, so storage can be an issue. Also, the paring knife is a bit bigger than most. Despite not being full tang knives they are sturdy and work smoothly. This set has an average customer rating of 4.5 out of 5 stars on Amazon. This set is Amazon’s choice, which is why it is on our best knife set list. With 18 quality pieces, we checked to see if there was duplication just to bulk up the number of blades. 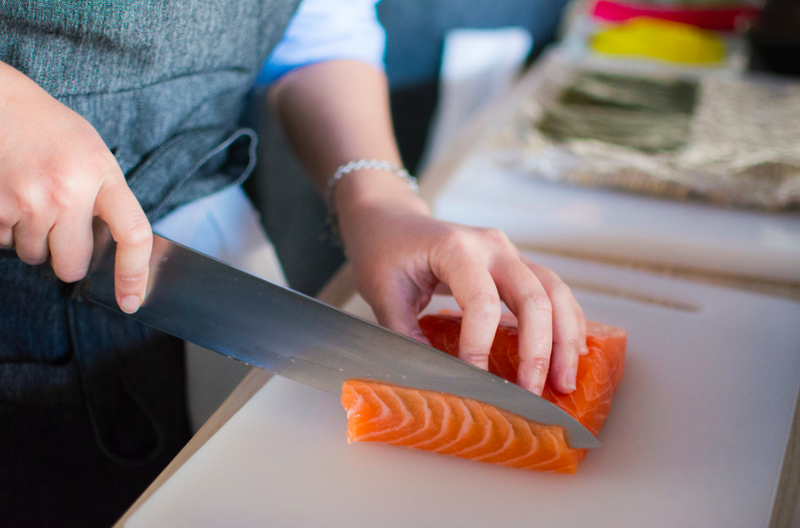 The variations on the steak knives are warranted if you have a mid-sized family and the specialty knives like the Santoku and Partoku (a smaller version of the Santoku) are an excellent addition for the budding chef. The blades are made from high carbon stainless steel and are fitted with poly handles that have adequate grip. The knives feature the Taper Grind Edge Technology which allows them to hold the edge better and longer. Aesthetically, the combination of stainless steel and black handles, as well as wood storage block, is very attractive. Another advantage is that the set comes with a lifetime warranty and a sharpening accessory. The drawback with the set lies with the block which has some loose slots. It has an average customer rating of 4.4 out of 5 stars on Amazon. When looking for the best knife set the subject of handcrafted knives will inevitably come up. The Messermeister San Moritz Elite 9-Piece Knife Block Set features handcrafted knives and really stands out as a statement piece in the kitchen. 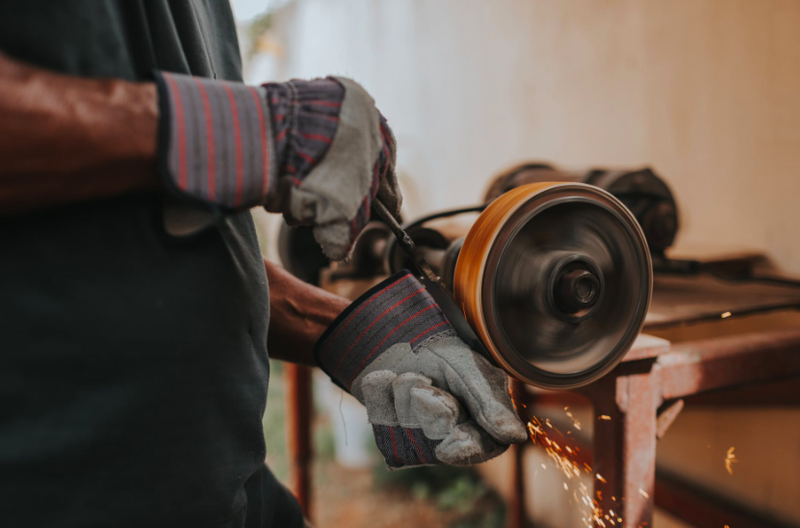 Their knives are among the few that are still forged in the traditional way of hot dropping and hammering. The knives on this set are specialty knives some with the Granton edge and the wood block has 16 slots so you can add to your collection in future. The knives are made from high carbon German steel with the tang fully molded into the handles. All handles are made from polyoxymethylene POM, a very strong material that lasts a long time. Their blades are hardened and tempered to achieve the perfect balance. They are also hand stropped on a cloth wheel to create a super sharp edge. The biggest advantage with this set is the excellent quality of the knives. They achieve this quality by using traditional forging methods. This means that the blades will not only last but they are unique since they receive individual attention. They also have a lifetime warranty and come ready for immediate use. On the other hand, the empty slots on the wood storage block can be unsightly and give the impression of an incomplete set. This set has an average customer rating of 4.0 out of 5 stars on Amazon where you can buy it as well. It is really no surprise to find a Cuisinart offering on our best knife set list. Their products are quality and have a long service life. The blades come in a black holder, a nice deviation from the warm wood option. The blades are from high carbon steel and have hollow handles which give them a lightweight feel. Their edges are well sharpened and the handles are steel. The combination of stainless steel and the black holder give it a polished finish. 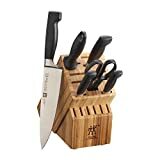 With 4.3 out of 5 stars average customer rating on Amazon, it's clear that this knife set meets the requirements of most users. The quality of these knives is without question what makes this the best knife set. Unfortunately, the storage block has some jaggedness within the slots which makes retrieving the knife cumbersome sometimes. It has an average customer rating of 4.3 out of 5 stars on Amazon. They come ready to use and have a sturdy construction. The set also comes with a lifetime warranty and with the right care (no dishwasher) they will serve you for a long time. They have an assortment of knives which makes it a very versatile set. This Zwilling knife set contains knives made from high carbon stainless steel each forged from a single piece. The company uses an exclusive formula that contains three steel types to come up with FRIODUR blades. These are welded together through a sigma-force technology and ice-hardening techniques that are exclusive to Zwilling knives. Both technologies play a hand in the blades flexibility, non-stain and sharpness retention qualities. This particular set of knives are Zwilling's best sellers, the best knife set from their range of knives. The construction has longevity, balance, and safety in mind, but it doesn't forget style. The handles are made of a seamless tough polypropylene that is ergonomically designed for comfort and lightness as well as hygiene. It comes with a wooden block that not only has room for the set of seven but also for old favorites in your kitchen as well as future acquisitions. This knife set comes with a lifetime warranty. 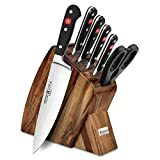 You can buy this Zwilling set on Amazon where it has an average customer rating of 3.5 out of 5 stars. 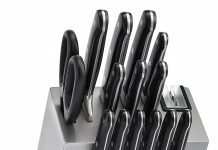 The unique feature about the Sabatier 12 piece knife set is the storage block's ability to automatically sharpen each of the 12 knives. Each knife slot on the block comes with a ceramic sharpener so that every time you place a knife back in its slot the knife's edge hones as it slides through. The blades are high-carbon stainless steel and corrosion free. They have a full tang design that allows proper balance and the three riveted handle has a comfortable grip. The block is actually wooden with a matte finish that looks great on your kitchen counter. With this set, you can always be sure you have a sharp knife at hand thanks to the edge-keeper self-sharpening Sabatier technology. 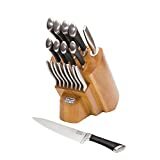 You can buy this 12 piece knife on Amazon where it has an average customer of 4.0 out of 5 stars. Wusthof has been making knives for more than two centuries. 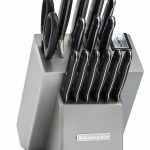 Their Classic 7 Piece Slim Knife Block Set is one of their best sellers. The blades in this set are high carbon stainless steel and are full tang. They are lightweight with the perfect balance to the blade. Their blade’s sharpness is 20 percent sharper than ordinary knives while holding the edge twice as long. This is due to the exclusive Wusthof's (PEtec) technology as well as the 14-degree angle on the knives. The knife handles come from a durable synthetic material (polyoxymethylene) that has a tight molecular structure for better durability. It also adds a lightweight feel to the knives. The block has a slim design and comes in six colors to suit any kitchen décor: Cherry, black, bamboo, acacia, natural and walnut. The set comes with a lifetime warranty. 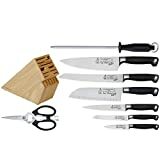 You can buy this Wusthof knife set on Amazon. It has an average customer rate of 4.8 out of 5 stars, the best knife set rating on our list. Before buying a knife set it's best to understand what to look for and why. The best knife set has a multi-purpose chef's knife, a paring knife, and a serrated knife as the basics. With just these pieces your kitchen can run efficiently. Additional knives include the meat cleaver, carving knife, boning knife, fillet knife, utility knife, tomato knife, and a bread knife. Be on the lookout for sets that have the same knife with slight variations and try to sell them as additional unique blades. 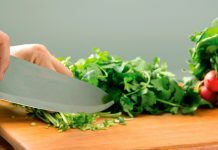 In general, there are 10 knives that home cooks should really know well, but most of us aren't going to use them on a daily basis. There are three things to look for when choosing a quality knife set: the construction, materials used and the balance on the knives. Knives with the proper balance do not put stress on the wrist and/or forearm. The construction is solid with the ability to withstand the rigors of daily use and constant sharpening. And the material used is sturdy but malleable enough to sharpen. We have used these three qualities to review the top knife sets on our list. A warranty is important because it offers buyers the guarantee that the product is safe and good quality. It also gives you an avenue for addressing any issues that arise with the product directly to the manufacturer. A knife set with a warranty protects your interests as a consumer. The main reason is that the dishwasher soap is abrasive, and wears down the blade’s edge. It also facilitates rusting on all quality knives. Specialty knives like those in your best knife set should be hand washed and dried immediately after. The price range is dependent on the quality of the knives and the variety of knives in the set. Prices can range between $50 and $700. Some knife sets can be upwards of thousands of dollars, we didn't cover those in this article. We considered the construction of the knives in terms of blade quality as well as how balanced the knife is from the blade to the handle. We also looked for any safety features on the knives like grips on the handle and an ergonomic design. Finally, we looked at how essential the knives in the set were and whether there were any duplicate knives with slight variations to bulk up the number of blades on the set. But above all, we sought out verified buyer reviews, so you know what you think you are ordering is what you'll be getting. The best knife set is really one that fits your kitchen needs. All the brands above are excellent choices. 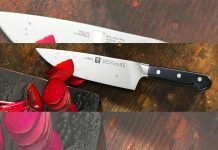 Cuisinart’s offering provides you with dependable knives while the Sabatier set goes a long way to offer you convenience with the edge-keeper self-sharpening Sabatier technology. Wusthof has the best knife set when it comes specialty knives. 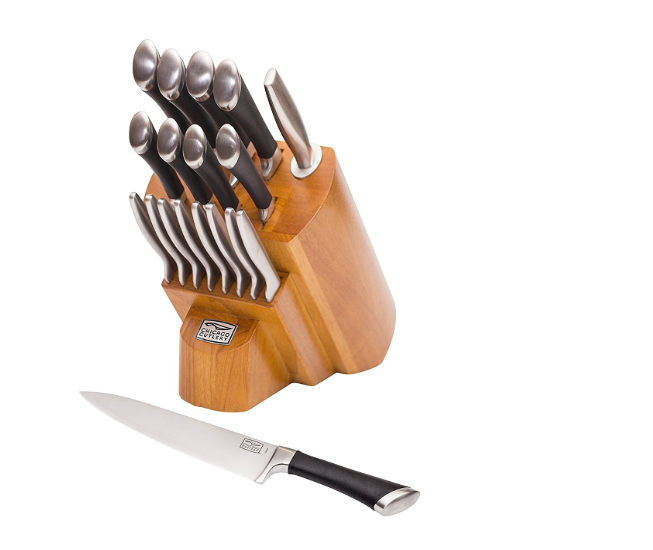 But, for our money, the best knife on our list set is the Messermeister San Moritz 9 piece Knife Block Set. This is a dependable and classic kitchen knife set. San Moritz's knives are handcrafted, very strong, hardened, and tempered giving them long service life. The block also leaves you room to grow your knife set by adding 7 more empty slots. The modern home cook really can't ask for more than that. Do you have a favorite knife set that didn't make this list? Tell us about it in the comments!